I picked up my guitar again during the summer of 2016. Fifteen years had passed; fifteen years without my music. Something happened when I opened the case and the voice of my guitar talked to me once again. This is very emotional and hard to explain in words; music often touches me in a way that is immensely enriching. I guess I´m a little crazy when it comes to music but this is who I am. The guitar is a voice that speaks straight from my heart and soul. I had no choice but to open the door to this world and let the voice of our music be heard. Since music is so special to me I must be honest and true; and then, only then, can I find strength and growth from my music. It´s like my soul materializes through music. And this is like living forever. Yes, Rock´n´roll is my Lord and the guitar is my sword. It´s like my soul materializes through my music. Already when a string has started to sing it has started to die. There are some technical tricks you can use to lengthen the life of a note such as using feedback, or the finger-vibrato by which you create a friction against the fret. You can prepare the fret in order to get a raw surface that improves this friction but this raw surface is soon polished away. Using the e-bow is one way to get a long endless note, but it´s hard to combine with the desired attack from the pick. This fight against the dying of notes is always a major concern. Back in the 1982 I had an idea of a guitar that was to have 9 strings. There were notes and melodies I wanted to play that were not possible due to the limitations of the fact that my guitars only had six strings. I wanted more in both ends both at the top and the bottom. This was like a dream of mine that sadly never came true. The guitar is an instrument that is very, very special to me. When I was thirteen I picked up the classical guitar and soon I realized the magic of it. To me my guitar is another voice, a second voice to express my emotions. In music school, I took lessons in a number of instruments, beginning with piano when I was seven, and later on the trumpet and the violin. I also studied classical music theory for some years including the art of composing. I can´t explain why the guitar is so special to me. 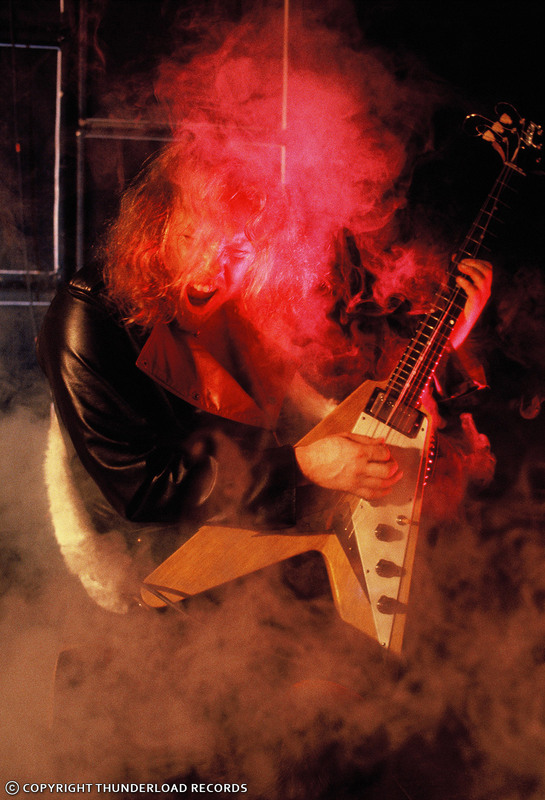 Sometimes when I play or listen to solos, and sometimes heavy metal themes and harmonies, I can´t restrain myself. I get completely lost in another world. Quite often it also happens with vocals. With the guitar I guess it has to do with the vibrations from the strings that are going through my body. The combination of this physical experience and my ears catching the notes and harmonies and my body experiencing the rhythm is what makes me mesmerized. 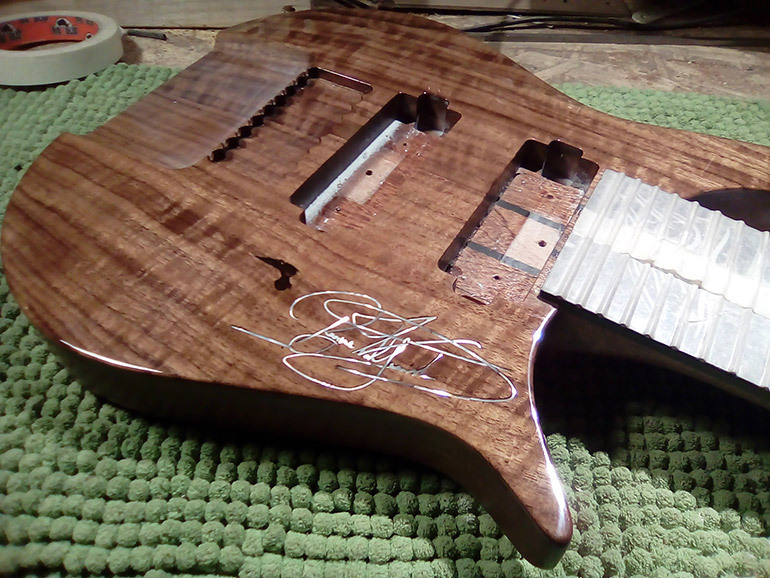 By the fall of 2017 I came into contact with a fantastic luthier that is building my Wahlgaard guitar. I have designed everything myself: the body, the neck, the fretboard, the electronics and the microphones. I call it the Wahlgaard project. To get the colour of tone I wanted we made the body of old Mahogany and the top of Walnut. My family name is Wahlquist, meaning “the branch of the walnut tree”. So I was very lucky when I realized that the combination of Mahogany and a top of walnut will give me the timbre I want. 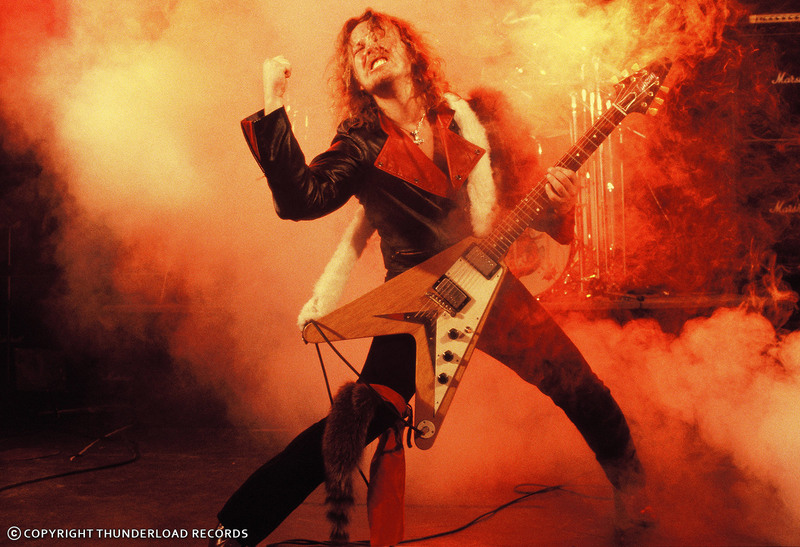 When I was working on Heavy Load material for the album Death or Glory and also Stronger than Evil, I got frustrated by the fact that I wanted to play notes that just were not possible. 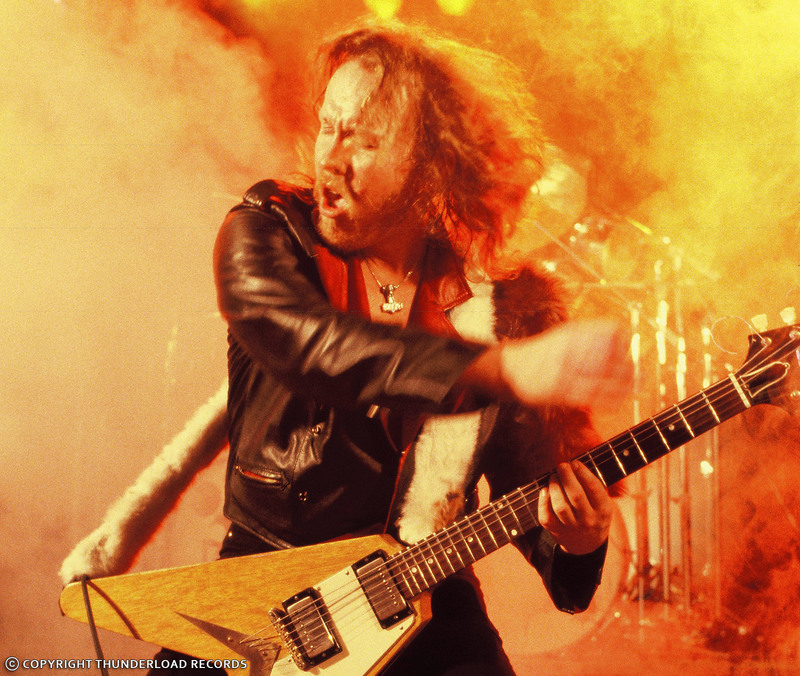 My favourite guitar was a fantastic Gibson Flying V from 1959 that I used on nearly everything. However, sometimes I picked up my white Gibson double neck for its 12-strings instead. One limitation with the double neck is that the short fretboards only have 19 frets. I love to use the entire capacity of the fretboard and very often I go to the highest notes during my guitar solos. The Flying V has 22 frets and even that is limiting for me. All this ended up in an idea in a custom built guitar with a longer fretboard for higher notes and additional strings for lower notes. I was already fantasising about what I would be able to do. This dream guitar never came true under this period. To my joy others have had similar thoughts and today you can purchase a 7 or 8 or even 9 string guitar from several manufacturers. During the winter of 2016/2017 I worked on my dream guitar by making sketches and trying different ideas. I bought a 7 string Kramer Turbulence R36. It was very inspiring and I wanted more. I had to go for an 8 string guitar or why not a 9 string. My dream guitar from 1982 was about to come true. I got very excited when I read about the 9 string versions being available on the market. I checked out the Schecter Hellraiser C9, thinking maybe it was the way to go. There were no 9 string guitars available so I tried out a C8 which has eight strings and I thought that this is the next step. I ordered a 9 string and they shipped it special from the states since there was none available in Europe at that time. This was going to be my first meeting with a 9 string guitar and with a scale that is as long as 28" (711 mm) – some people call guitars with this scale, baritone guitars. I adjusted the bridge to fit my playing style. In difference from my Flying V it had three additional strings in the bottom. Having three more strings at the bottom was exciting. Now I could play almost anything that came to my mind and many new themes and phrases really did come to me from playing this guitar. But this was not enough, l wanted additional notes at the top as well. For this I needed a longer fretboard with more frets. By then I knew this would be like opening the doors to a new world. Below, in my home, the original painting for the bonus section of the re-release of Stronger than Evil with my Wahlgaard. To me, they seem to belong together and to whisper a promise about things to come. The guitar is my sword and my Wahlgaard has a sharpness that will cut through metal. At the time of writing, the Wahlgaard has recently come into my life, just a few days ago, on Friday, December 22 – it bordered on feeling like a supernatural Christmas present. It was fantastic! I was overwhelmed by the aura and the emotions it arose within me. I had expected something special of course, but this was something extraordinary. 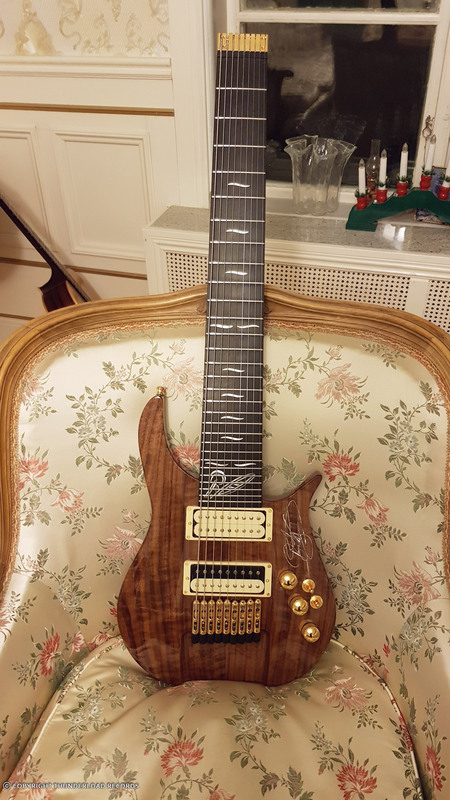 In late October 2017 I went to Prague to visit the luthier Dmitry Sushkov in his workshop and have an encounter with my long sought for Wahlgaard guitar [more about Sushkov Guitars]. Seeing and touching the Wahlgaard was an amazing experience that had resounded within me until this day. But now, when everything was in place with pickups and strings etcetera, it was more than words can explain; I loved it. My expectations were so high that I could hardly sleep the night before. In my sleep the guitar came to me with music that was out of this world. Come to think of it, maybe my relations to my guitars is a little strange, and it´s the same with our music and lyrics but that´s who I am, for better or worse. In companion with my travel companion and brother Styrbjörn, I plugged the Wahlgaard into my amplifier to hear its voice for the first time. I was excited of course and a little nervous. Would I hear its true voice and understand the words it may speak – words spoken in music; in harmonies and melodies that I was to bring to my world. The colour of tone which embraced me cut like a sword through air and hit my heart with thunder. From Styrbjörn’s face I understood that we both were touched. The shivers we both felt by the deep and sharp voice was an overwhelming experience. Like lightning from a clear sky new melodies came to life; only the future will tell what comes out of this adventure in music: If I am capable to understand the power of the Wahlgaard; if I have the sensibility to let my heart be touched and let the flow of music lead the way. No matter what: The guitar is my sword and my Wahlgaard has a sharpness that will cut through metal. Hail the power of Heavy Metal. 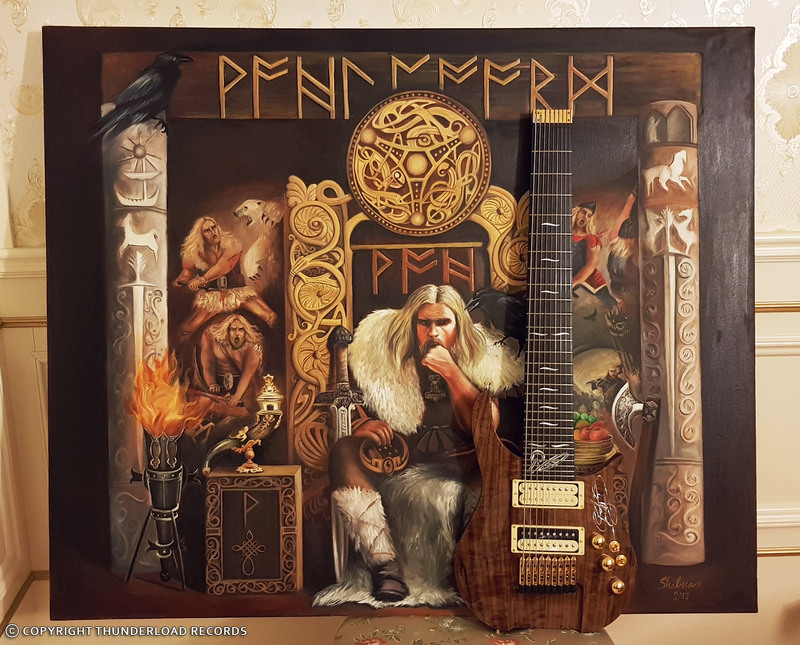 We decided that the voice of this guitar must be used for the first time on a special extended alternative version of The Guitar is My Sword that Styrbjörn and I are working on. It will be a bonus track for Death or Glory, maintaining the original track of course. An electric guitar with nine strings tends to get quite heavy. On stage, I like to use a guitar that is light so it won’t weigh my back down so much, especially with long sets in mind. However, the weight has some significance for the guitar’s stability and it is even more important for the note sustain in the entire construction. The moment the pick hit the string and the vibration starts the note starts to die immediately. Moving parts are especially absorbing; as a result, they shorten the life of the notes. Consequently, my design is intended to maximize the ring of the notes by way of eliminating as many things as possible that tend to absorb the energy from the strings. For instance, if there is a long part of the string outside the nut and below the bridge, it consumes energy. Using a nut-lock is a solution for the nut. Not having a vibrato sytem is a solution for the bridge. These two measures result in a guitar that stays in tune in a much better way and that meets with a faster response to the energy from the pick – when bending a string the response is more direct. In my opinion these are very valuable attributes. Thus, my design is headless with a minimum of string outside the nut and with a tuning bridge that results in a minimum of string length between the bridge and the tuning mechanism. Thanks to the fact that the guitar is headless, the centre point of the weight is moved to a lower position and makes it possible to go down in weight remaining perfect balance. The double cutaway design is very common but I wanted to bring the ergonomic way of thinking up front and create maximum access to all frets. Some classic designs support this; the flying V and the SG to mention two. In order to get the horn away from my lower arm my cutaway is very open. This is not something new. The Brian May design has a similar open cut away with a small horn that gives good access. Over the years I have come across many different pickups and the ones that fit me best are the old Gibson PAF from the late 1950s. Their sound can, however, differ quite much from sample to sample. I have a couple that I like a lot and they became the role model. They could not be used for the Wahlgaard since it´s a nine string. The luthier Dmitry and I discussed it and came to the conclusion that the only way to solve the delicate situation was to make a couple of unique pickups for this guitar. So through trial and error we found a way to get the same quality as my favourites. 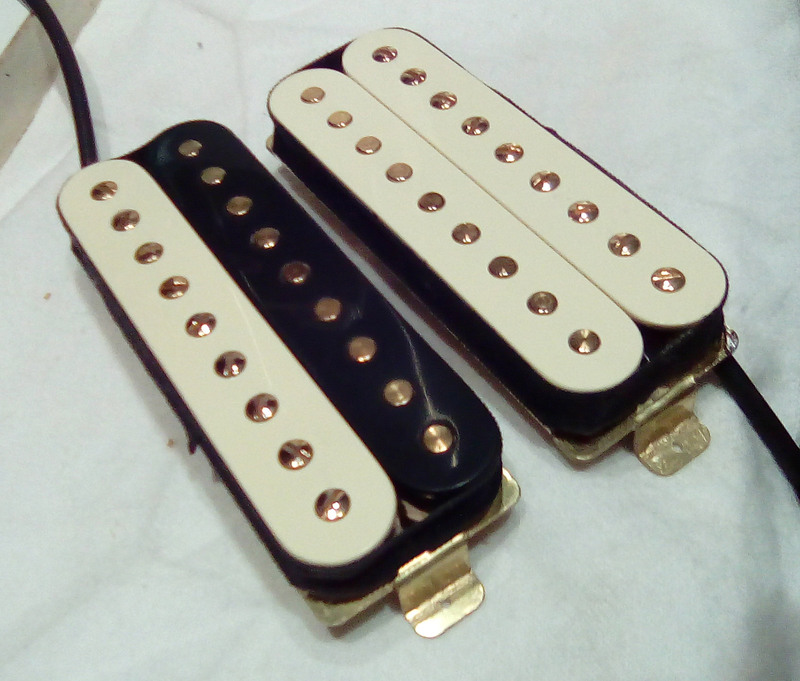 The visual design is also very inspired by the old Gibson PAF pickups. Dmitry managed to get his hands on some very high quality vintage components so I really got what I wanted; that is, the old kind of electronics of my old 1950s Gibson pickups that has been my priced possessions for ages. The wiring is 1950s style since I prefer not losing any high-end treble when I turn down the volume. I use the volume quite much but very seldom the tone pot. When I turn down the tone pot I lose some volume but that is not a problem for me. The other solution would be to use a so called “Modern wiring” but then you lose treble as you turn down the volume. I am not very much into pedals I try to make my guitar sound as I want by the way I let the pick touch the string and the amount of volume. I enjoy getting a soft sound from hitting the string with a minimum of energy, and getting full power from hitting hard and every type of sound in between. So it´s all a mixture: the energy to the string, the angle of the pick and the volume going to the amplifier making the tube and electronics work for you. But basically, for the solos I want a little more power and more sustain and for the rhythm parts I want a little cleaner and less distorted sound. So, I use the volume to get different sounds from the amplifier, in the same way as I believe everyone else is doing. Another simple solution to the same end is to use a pedalboard and I know a lot of people who make many different sounds by using effects and it’s an exciting world with many colours. But you must be close to the pedalboard. Another reason for me not to use a pedalboard so much is that I enjoy going to the other side of the stage and to go up and interact with Styrbjörn around his enormous drum-kit. As a consequence, sometimes there is a need to change the volume for a guitar phrase when I am far away from the pedalboard. So I decided to have a high quality preamp installed inside the guitar to have that possibility where ever I am positioned on stage. I also wanted to be able to lower the volume to a specific level for the softer parts without using the volume knob on the guitar. The Wahlgaard guitar has a three way switch for this: (1) Normal, the signal bypasses the preamp; (2) High, the level is increased a couple of dB that you have fixed beforehand; and (3) Low, the level is set to a decreased level you have fixed beforehand. It was of the utmost importance to me that the original sound of the guitar was not affected. I have already talked about why I want nine strings. Basically it´s all about the ability to play more of what comes into my head. For me it´s like having more colours to paint with and that´s very inspiring. The scale has to be at least 28" to get a proper sound from the bottom strings. All nine strings guitars that I have come across have three lower strings, comparing to a regular six string guitar. The longer strings give a different spectrum of overtones and the string reacts differently to the energy from the pick. It can absorb more energy and therefore give you a longer tone and the difference from full power to the softest most delicate tone means more dynamics and more ways of expressing your emotions. You can say that it enables you to paint in more colours; my guitar gets a richer voice. In addition, when you bend a longer string the response is different from that of a shorter string. These 28 inches offers the possibility of having a couple of extra frets at the very top and still being truly useful. 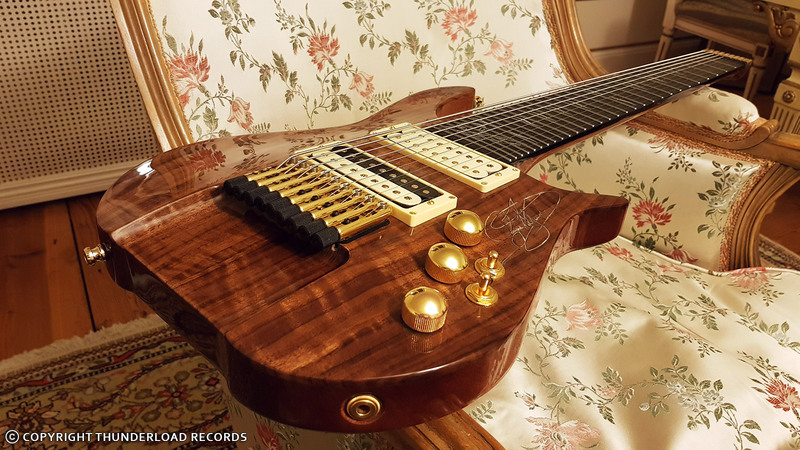 The Wahlgaard has 29 frets and all of them are playable for real. By having thinner frets from the 21th-29th fret the playability is improved in this high position. I do enjoy playing melodies in high positions and then go down to the low position and by doing so employ the powerful dynamics of the entire guitar. The wood of an electric guitar are significant for the quality of the instrument. In my opinion most important is the stability of its body and how it reacts to the vibrations. The body need to support the vibration and not absorb it. Other parts are also of importance for this purpose; for instance, the bridge and the neck. Mahogany is a fantastic material for a craftsman. For many centuries it has been used to create high quality furniture. One reason is that the fibre of the wood gives it exceptional attributes. It is easy to carve and when dried properly it is very stable. This stability is essential for an instrument. I have always favoured guitars on which the neck is set to the body. In general the set neck gives me a feeling that I prefer from bolted neck. On the other hand, both methods are equally good when done by a good luthier and I actually do have some guitars with bolted neck that I love. It is hard to explain, but for some reason I prefer set neck; I guess it is emotional. I have had some Fender Stratocasters from 1963-1964 and they were great guitars but I never felt united, as one, with them. The Stratocaster is a beautiful guitar with a very attractive design and the sound and music that many guitar players create with it is fantastic but still I have not yet tried one that feels like it´s my guitar. Most of the guitars I have favoured have always had a set neck. However, to my great surprise my 7 string Kramer Turbulence R36 felt as I was one with it, in a very short time and yet it actually did have a bolted neck. For the Wahlgaard the neck is set to the body at an angle of 3°. For me this improves the playability and prolongs the time I can play without getting tired and this is especially valuable on stage. Nine strings create a lot of tension and for the neck to be straight you need a mixture of materials in layers that together give you a couple of things. Perfect playability and a nice feeling and furthermore stability that is strong enough to handle the tension from the strings. I decided that the Wahlgaard should have five parts, two of carbon fibre and three of mahogany. I have a guitar made completely of carbon fibre, a Steinberger XT that has many attributes I like; such as sustain, the stability and the way it stays in tune forever. Carbon is a material that truly has many attributes that is good for building a high quality guitar. What I miss is some of the warm feeling I get from a piece of wood and the tonal quality. By having carbon for strength and mahogany for emotional and tonal quality I get a combination that has all the good qualities I want. Some of the guitars I have tried with 9 strings have a neck width and thickness that does not fit me; and it’s the same with some of the bass guitars having six or seven strings. I do enjoy playing bass guitar, I have a five string Fender Precision, a five string Steinberger and a 7 string Ibanez. Some guitars are too narrow at the nut, too wide at the bridge and sometimes the neck is too thick for my playing style. I do not like when it is hard to get a clean sound when playing chords close to the nut. The neck of the Wahlgaard is very strong and it is thin to provide good access to all strings. When the neck is wide in the high position I cannot easily use the bottom strings without changing playing position. The thumb must leave the back of the neck and the hand moves up over the fingerboard. I prefer supporting my musical thoughts by using an instrument – a tool for making music – that is as ergonomic as possible.. Many of the guitars I have come across are too narrow in the nut for me. The strings are so close that sometimes it´s impossible to get a clean sound from all strings when playing close to the nut. Unintentionally I tend to dampen one or two strings. Most electric 12 strings are even worse. For me it´s almost impossible to play chords close to the nut but there are some 12 strings around though that has considered the physical facts and created good ergonomics for the guitarist. The Wahlgaard guitar has of course a width of the nut that is comfortable for me. I wanted the fretboard to feel nicely, to have a woody feeling. I am partial to the sound quality of Ebony so the fretboard is made of a piece of old black ebony. Ebony also offers me a strong surface that stands the abrasion of many tens of thousands of hours of playing. Moreover, it holds the frets perfectly and one day, if it is needed, it can be re-fretted with optimum quality. The fretboard radius alludes somewhat to that of the classic Spanish guitar. It has a radius of 20". My first guitar was a Spanish guitar that I picked up from my brother Styrbjörn. At a very young age, he started playing guitar at music school but soon he turned to drums instead. You can say that I couldn´t keep my hands of it and before long I had taken it over. Classic piano was the instrument that introduced me to playing music but at once when I had picked up the guitar it became my number one instrument. For many years I took lessons in classic guitar playing. The Spanish guitar has quite a flat fretboard radius. The Wahlgaard has quite a wide fretboard, it is 86, 5 mm at the 24th fret. Being this wide a higher radius would make the guitar less ergonomic for me. The walnut tree is our family tree, our name is Wahlquist meaning “the branch of the walnut tree”. So I designed inlays and decoration elements for the fretboard designed to connect to the walnut tree. 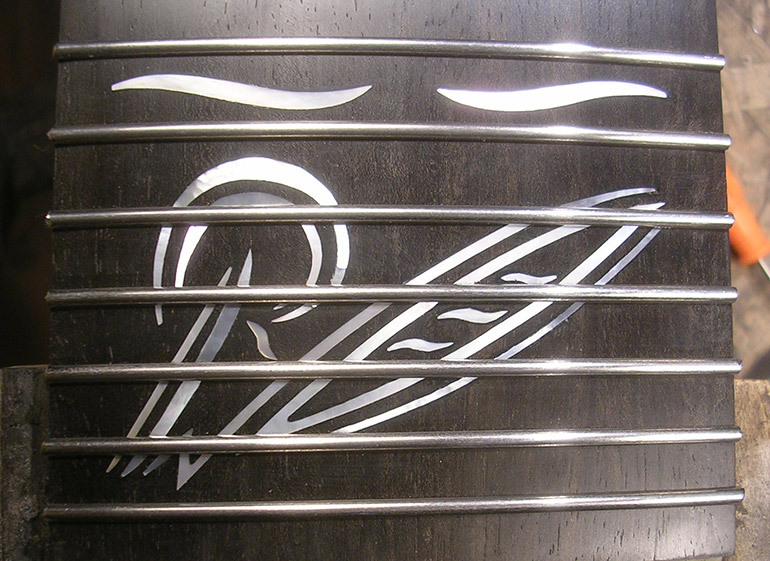 The small inlays are aimed to be stylized leaves and the larger inlay above the 24th fret is also aimed to be stylized leaves combined with the two first letters from my name “R” from Ragne and “W” from Wahlquist and from Walnut. Because of the above I named the guitar “Wahlgaard”. I prefer wide frets. I chose medium jumbo .106" x .036" for the feeling, for the playability with good sustain and for the bending qualities. 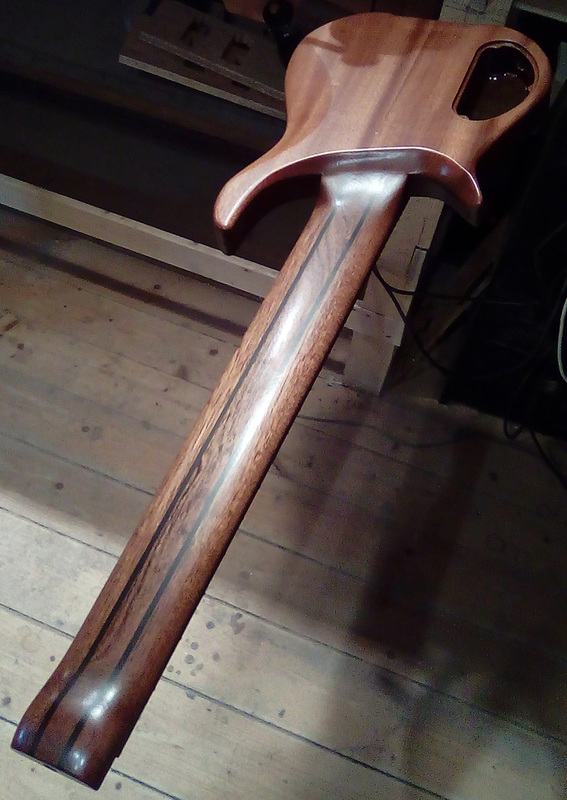 But, since the Wahlgaard has 29 frets the very highest position would be less playable with wide frets so from 21st to 29th fret I chose thinner frets, modern narrow and tall .090" x .055". The frets are of stainless steel and are almost impossible to wear out. Frets this strong means more hard work when polishing for optimum playability but what you get in return is frets that are more or less eternal. The bridge is also the tuning mechanism. I chose a bridge that gives a straight line for the string. A short string from the bridge to the tuning mechanism improves the guitars ability to stay in tune. A straight line and only one angle give the string a longer life. This is especially valuable because of the scale being 28".